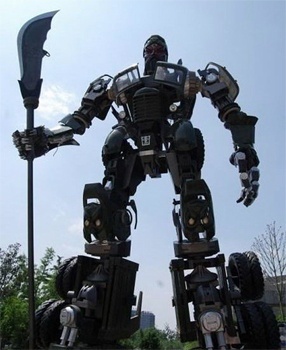 Art students in China have taken an old truck and recycled it into something truly extraordinary: a life-sized sculpture of a giant robot warrior. We're used to knock-offs of popular things coming out of China; most of the time, such things are pieces of junk that fall apart pretty quickly. However, some students at the China Central Academy of Fine Arts have created a copy that is better than the original: They built a 32 foot-tall statue of a Transformer as their final graduation project. The statue was originally an old junkyard truck that was stripped down and rebuilt into what is pictured at right. As a result, the statue itself is actually built almost entirely from the truck's parts, and weighs over four tons. The only parts of the piece that aren't recycled from the vehicle are its head and weapon. The project also cost only $4,470 to build. The statue is actually created in the image of Chinese deity Guan Gong (also known as Guan Yu). Guan Gong was a general that lived during the second century and was a major player in the downfall of the last Han Emperor. He was later deified and is still worshipped by people in China. To say that this statue is awesome is an understatement. I personally think more schools around the globe should encourage their students to build Transformer statues that pay homage to national heroes.